The City Law School's Dr Mauro Barelli, has published 'Seeking Justice in International Law: The Significance and Implications of the UN Declaration on the Rights of Indigenous Peoples’. 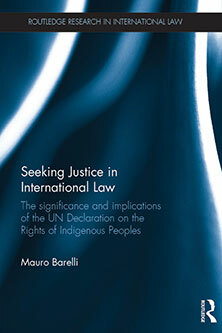 Dr Mauro Barelli, Senior Lecturer at The City Law School, has recently published 'Seeking Justice in International Law: The Significance and Implications of the UN Declaration on the Rights of Indigenous Peoples’ (Routledge). Throughout their history, indigenous peoples have experienced various forms of injustice, including colonisation, dispossession of lands and resources, oppression and discrimination. As a result of various efforts to undermine and disrupt their societies, they have found themselves in a constant state of vulnerability forcing them to continuously struggle for their own survival. This centuries-old struggle has taken different forms and directions over time, according to the relevant contexts and circumstances. A distinguishing feature of indigenous peoples’ contemporary efforts to protect their lives and destinies has been their strategic use of international law. Dr Barelli’s book seeks to explore the transformative potential of international law by examining precisely the dynamics and outcome of the indigenous peoples’ campaign for justice. The broader question that the book seeks to answer is whether the adoption of the 2007 United Nations Declaration on the Rights of Indigenous Peoples points to the existence of an international law that promises to provide valid responses to the demands of disempowered and vulnerable ethno-cultural groups. In assessing the potential and limits of international law in responding to the human rights claims of these groups, the book highlights that the action and identity of an actor, the perceived moral force of its claims, and the level of political threat posed by the latter, will each contribute to determine the outcome of any particular human rights struggle. Dr Mauro Barelli joined The City Law School in September 2009. Previously he taught at Cardiff University, where, in 2012, he also obtained his PhD. He is Director of the PhD programme, and teaches Public International Law, International Human Rights, and UK Constitutional and Administrative Law. Dr Barelli's research interests lie in the area of Public International Law. Besides ethno-cultural group rights, he is particularly interested in the study of Chinese approaches to international law.